Idaho’s rivers access some of the most pristine terrain in the state. They are home to abundant flora and fauna, an impressive network of hiking trails, and some of the country’s best whitewater. Of all the rivers that flow through Idaho, perhaps the most spectacular is the Middle Fork of the Wild and Scenic Salmon River. Considered the state’s “Blue Ribbon” river, the Middle Fork Salmon boasts non-stop, Class III-IV whitewater, natural hot springs, and excellent fishing. And then there’s the scenery—soft meadows that roll towards the base of soaring mountains, craggy canyons ribboned with waterfalls, deep green forests and grassy hills dotted with wildflowers…the diversity and beauty of the Middle Fork is stunning. Join OARS and see how good a river vacation on this breathtaking waterway can be. This unique, active hiking departure includes all the beauty, wildlife, and comforts of a standard OARS trip, but with a special emphasis on hiking. Escorted by expert hiking guides, guests carry daypacks with drinking water and a delicious packed lunch on the longer treks. Back in camp guests are greeted with appetizers and a dinner spread that puts traditional backpacker fare to shame. After dinner and stories, weary hikers bed down in warm sleeping bags, atop thick, cozy, sleeping pads. Inside your rugged, roomy tent or under the starry night sky, you’ll sleep soundly, serenaded by the crickets and the rush of the passing river. We’ll meet at 8:00 PM at the Mountain Village Resort for a pre-trip meeting. This is an opportunity to meet your fellow travelers and trip leader and ask any last-minute questions. Your guides will give you a thorough trip orientation and pass out your waterproof river bags so you can pack your belongings that evening, and confirm the meeting time for the following morning. We’ll take a scenic flight to our put-in at Indian Creek, where your boats and crew await. After an informative safety talk and brief paddle raft/inflatable kayak instruction, we take to the pure blue waters of the breathtaking Middle Fork. Our first day generally sets the pattern for our week on the river. Typically, we spend a few hours on the water in the morning, stopping for a great hike, a visit to a waterfall or an Indian pictograph, or a soak in a natural hot spring. Come lunchtime, we pull over to a sandy beach and enjoy a delicious picnic. After lunch, we get back into our boats for more exciting whitewater. Be sure to try your hand at the paddleboat and inflatable kayak! Mid- to late-afternoon, we stop and make camp; you grab your bags and set up your tent while we take care of the kitchen and “living room”—camp chairs and the site for tonight’s campfire (if permitted). Before long you’ll be savoring pleasing hors d’oeuvres and the beverage of your choice! Read, nap, or just sit back and laugh with friends and family as we prepare dinner. After another satisfying meal, the evening is yours to spend however you wish. This hiking trip enjoys some of the longest days of the year; maybe an after dinner walk, music, stories or jokes will bring us together tonight; maybe the popping of the fire, the whisper of the river and the clarity of the big, star-filled sky will encourage silent reflection on the amazing wilderness that is, for now, our home. Over the next few days, we have an ambitious collection of hiking options and will choose among them based on the weather and group fitness levels- there are a lifetime of incredible hikes in this canyon. We’ll start off hiking the beautiful river trail in the upper canyon, a nice warm-up for the challenging days ahead. Towards the end of our voyage, the Middle Fork rushes into a narrow gorge that creates some of the most high-intensity and continuous whitewater of the trip. Paddle hard through Redside, Rubber, and Hancock rapids, and enjoy the sudden spectacular change in scenery from wooded hills to the sheer granite walls and huge boulders of Impassable Canyon. Finally, we reach our take-out at the confluence with the Main Salmon. Our journey has ended, but we’re sure that although you leave the river, the river will never leave you. The day before your trip we will meet at 8:00 PM in the conference room of the Mountain Village Resort in Stanley, Idaho for a pre-trip meeting. Your trip leader will provide a thorough trip orientation and pass out your waterproof bags so you can pack your belongings that evening. The trip leader will also confirm the meeting time for the following morning and give you an opportunity to ask any last-minute questions. Gem Air offers a round-trip air shuttle package to and from Boise for approximately $410*. Boise (BOI) is served by several commercial airlines including United, Delta, Alaska, Southwest, Allegiant, and US Airways. Please note: When booking your flights, be sure you arrive in Stanley the day before your trip starts. You will need to arrive in Boise no later than 3:00 PM as the last flight from Boise to Stanley generally departs at 4:30PM. When your trip ends, OARS will provide land transportation back to the town of Salmon, with arrival between 4:00 and 6:00 PM. Plan to spend that night in Salmon. Gem Air will begin return flights to Boise the next morning. For your connecting flight home, we recommend booking your departure from Boise at 11:00 AM or later. To arrange your flights, please contact Gem Air (208) 756-7382. Please mention you are an OARS guest when making your reservation. For transportation from the airstrip in Stanley to the Mountain Village Resort, please use the phone at the airstrip to call Mountain Village Resort (208) 774-3661, and a complimentary shuttle will come and pick you up. The Stagecoach Inn in Salmon, where you will be dropped off at the end of your trip, also provides a complimentary shuttle from their motel to the airstrip in Salmon. Please let the reception desk know when you check in that you will need a shuttle the next morning to the airstrip. Please note: If you drive, you will need your car transferred from the meeting point in Stanley to the end point in Salmon. To arrange a car shuttle you may contact Caldwell Transportation at 208 774 2265 . They will deliver your car to the Stagecoach Inn in Salmon to wait for your return. A coach service is available between Boise and Stanley departing the Boise airport at 4:00 PM with an arrival in Stanley at approximately 7:00 PM. Reservations are required. Please call the Caldwell Transportation Company (www.ctcbus.com) at (800) 727-9925 for additional information and reservations. The cost for this service is approximately $93 per person. 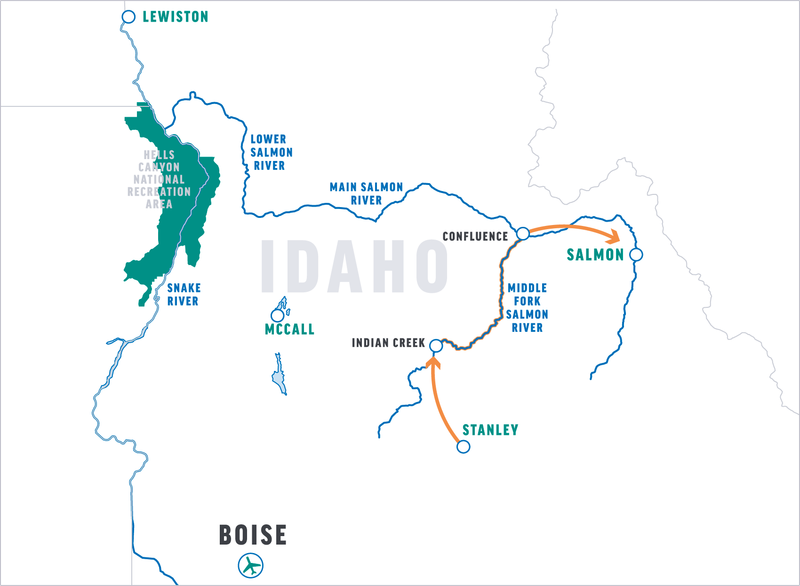 Please note: There is no coach service between Salmon and Boise; therefore if you utilize the coach service from Boise to Stanley to start your trip, you will need to fly from Salmon to Boise at the end of the trip. On the final day of your river adventure, you will be dropped off in Salmon, Idaho at the Stagecoach Inn. You should arrive between 4:00 and 6:00 PM. We highly recommend you overnight in Salmon and depart the following day. Rated Class III-IV, the Middle Fork Salmon has more whitewater rapids than any similar-length river in the U.S.—over 100 rapids in 100 miles. Turn by turn, as each tributary surges into the river, the Middle Fork dramatically changes character from a big creek into a thundering river, all the while creating rolling wave trains and thrilling drops. Inflatable Kayak—Inflatable kayaks float low in the water, putting you in touch with the pull of the current and splash of every wave. On most trips, single inflatable kayaks are available, depending on group size. 12 years is the minimum age in Class III rapids, 7 years for Class II rapids. Helmets required. Ask an Adventure Consultant about this option, as it is not available on every trip. Please note: Dories are only available during high-water, early-season trips, and are dependent on water flows. During the high-water season, use of inflatable kayaks will be at the guides’ discretion based on safety concerns. Thomas Creek is a scenic hike on a clear trail 7.5 miles to Mahoney Lookout. There is a good vertical rise in those miles, but the trail is not too steep. Marble Creek trail runs up the drainage tributary 4 miles to an abandoned ranch with a picturesque meadow. Loon Creek Hot Springs are approximately one mile from the river with the option of continuing 3–5 miles beyond that. The Camas Creek drainage offers a 5 mile hike to the Yellowjacket Creek junction where there are two continuing hike options and pictographs. An all-day, 8 mile hike from Funston to Bear Creek point overlook involves lots of climbing, and some difficult short sections. However, even novice hikers have made it to the overlook smiling. Trail camp to Middle Fork lookout is a beautifully scenic all day hike to the fire lookout. This hike is 9 miles each way. Little Pine Camp offers a short, steep hike to a beautiful overlook. Approximately 1 ½ miles each way. The Waterfall Up & Up hike offers a few options: a short easy walk to the bridge at Waterfall Creek, where you can then continue downriver to a scenic overlook of Impassible Canyon, or you can choose to hike upriver above the falls to a scenic overlook of the cascade. Big Creek is a moderate creek side hike 5 miles to petroglyphs where you can continue on the well-used trail to the high country. Veil Falls is the best short climb to a scenic amphitheater and waterfall. Nugget Grotto is a short but sweet hike to an overhanging creek grotto. Hiker Special: Specially created for those active travelers who want to go the extra mile(s) on the trail, OARS offers a series of hiking-focused departures. On our Hiker Special itinerary, our guides show you all the amazing side hikes we don’t have time for on our regular departures. Each day we generally spend a few hours in the boats then set out on a new hike to explore seldom seen sites and dramatic views. Fishing Trips: Often overlooked, the Middle Fork offers some of the best cutthroat fishing in Idaho. The population of this unique strain of west slope cutthroat was almost destroyed by the end of the 1960s. A catch-and-release regulation was then imposed and that, along with the very limited access to the river and little angling pressure, has resulted in a river loaded with fish. Twelve- to fourteen-inchers are common, with an occasional sixteen- to eighteen-inch fish. Native rainbow, mountain whitefish, and bull trout are also caught here. Wine on the River: Our wine trips offer an elegant alternative to our regular departures, and combine mouthwatering menus and award-winning wines with the appeal of the wilds. After each day of river rafting, enjoy gourmet meals and premium wines introduced by regional experts. The wines are carefully chosen to complement the bill of fare each night, and each winery brings its own personality to the river, where tastings can turn into blending seminars or informative discussions of Old World versus New World wine making. Rest assured that these trips inevitably result in an outrageously good time. The Middle Fork is renowned for its trout fishery. To protect the resource, all fishing is limited to catch and release, with single barbless hooks. No bait is allowed. Our guides will be happy to explain proper handling techniques for catch-and-release fishing, if you are not already familiar with them. You can also fish for smallmouth bass and, in the fall, steelhead. You’ll need to bring your own gear. We recommend collapsible poles for ease in packing, light spinning tackle with 4- to 6-pound test, and an assortment of spinning lures such as Mepps, Rooster tails, and Super-dupers. Please bring your rod protected in a hard case. Fly anglers do quite well, especially in major tributaries. Non-residents of Idaho can buy a short-term fishing license by calling 1-800-635-7820. You can also purchase one online at www.fishandgame.idaho.gov. Additionally, licenses are available in Stanley at the Mountain Village Mercantile or McCoy’s Tackle Shop until 9:00 PM. Remember to purchase licenses by the night before your trip puts in, because there is no time to do so the following morning. *The use of drones is prohibited by the Forest Service or Bureau of Land Management on the Idaho’s wild rivers. During the day— Light-to-mid hiking boots are recommended. For the hiking trip each boat will carry an extra “boot bag” so you can easily access your hiking gear during the day. The best choice on the rafts is an amphibious shoe that drains water, protects your toes and won’t come off in swirling current. A retired pair of athletic shoes can work well, too. Sport sandals with a heel strap are a good option, especially on rivers with sandy beaches. Find professional-grade options made by Chaco® at www.chacos.com, the official footwear sponsor of OARS guides. Bugs and mosquitoes vary depending on location and time of year. It’s a good idea to come prepared with insect repellent. Long sleeved shirts and pants may be desirable at times. Occasionally on a very hot, dry year there are yellow jackets present. If you are allergic, please bring an epi pen. We supply a professionally laundered sleeping bag with liner, a pillow with a freshly laundered pillowcase, a sleeping pad, a ground tarp as well as a shared tent. The complete customized sleep kit that we provide is designed for your comfort and maximizes available luggage space. Our sleeping bags are degree rated depending on the season and are 33” x 84,” which is longer than the normal (80”).